home of the original State Roots design. 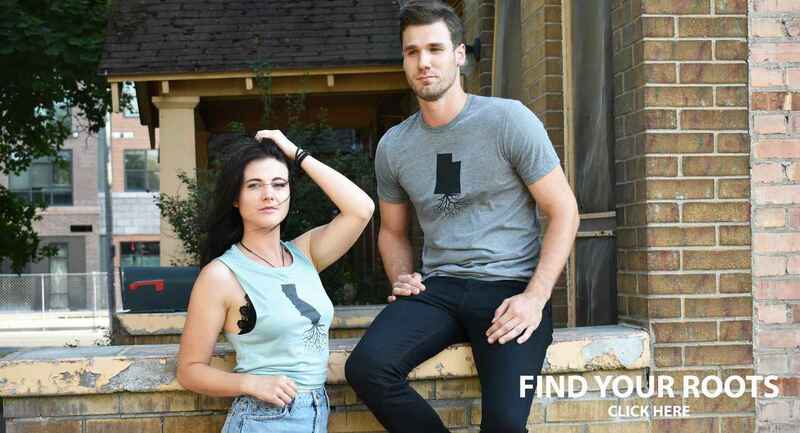 The concept behind our design is for those who love their state, whether it be the place you were born and raised or if you have found a new home state to put down your ROOTS. WYR’s main focus is providing quality lifestyle clothing and accessories. Our two founders have handpicked the entire line with fashion, durability, and comfort in mind. WYR prints and embroiders their copyrighted designs on a wide range of clothing, fabric types, and accessories. From newborns to Men’s and Women’s apparel - WYR has it all. We have a large variety of t-shirts, sweatshirts, hoodies, jackets, hats, backpacks, and ladies fashion wear. WYR is always keeping an eye out for new products that are consistent with the high quality and fashion that has become our STANDARD. WYR was started in Montana by two childhood friends - Aaron Sipe (who has a love for fashion, design, and alternative sports) and Brandon Slocum (who loves his state and all it has to offer). Sipe started designing the company with a simple die cut sticker that led to the first tee shirt. Once this first shirt was created Aaron and Brandon realized they were on to something and that they were not the only ones who loved the new design. Soon after, Slocum was selling shirts and hats out of his pickup and WYR Clothing was on the streets for the world to enjoy. Sipe continued to design and select the right products people would really enjoy and wear in their everyday life. WYR was granted the copyrights for all fifty states and production was started on printing and building an inventory for the country to represent their ROOTS! Since day one Slocum and Sipe have been working to provide their customers with a great products, excellent customer service, dependable order fulfillment, and lasting relationships. If you or someone you know is looking to fill their shelves and clothing racks with high quality desirable products, look no further WYR Clothing is your answer. Contact us at your convenience and discover your ROOTS!